I am more a cocktail sort of guy, but this red Zinfandel not only grabbed my pocket-book, it enslaved my palette too. And if you enjoy a good laugh along with good friends, food and wine, then read their back label, written below. 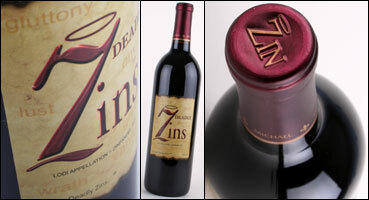 I plan to try as many of their wines as possible and become a zinful wine-O myself (wink). Oh, and I am also a big fan of anything that mocks or makes a parody of orthodox religions; pick any one of them! Oh Lord, forgive me my Zins. A self-centered repenter, Vanity’s bride. Sloth is the cloth that’s woven my rug. A Glutton with nothing but a huge appetite. Over-zealous and jealous, I want so much more. I concede to the Greed demanding release. My sin is the Zin enslaving my Lust.